Dr. Carley has been practicing veterinary acupuncture at Hunters Glen for over 20 years. Acupuncture has been a treatment modality for over 3500 years. It is an important part of Traditional Chinese medicine. It has experienced a surge in popularity over the last 5-10 years as more and more veterinarians sign up for training and add it to their practice. Dr. Carley believes that veterinary acupuncture can play a very important role in healing. He can customize a treatment plan for your pet that combines both Eastern and Western medicines in a way that works best for both you and your pet. He was certified in veterinary acupuncture in 1994 by the International Veterinary Acupuncture Society and has been utilizing it at Hunters Glen ever since. In traditional medicine, the body is approached as several systems working in balance. All of these systems are integrated, or holistic, and a disease process affecting a single system will, in turn, have an effect on all systems and their natural balance. When determining an appropriate treatment, the manifestation of the disease is more important than the disease itself. Instead of targeting an isolated disease and treatments, it focuses on reaching a balance within the body and treating the animal as a whole. Each organ within the body has specific points that can be targeted and utilized in treating a condition. Acupuncture works to tap into the body’s own healing abilities and help restore balance within the animal through stimulation at specific points that will be determined based on an animal’s condition and circumstances. If you have more questions about acupuncture and how it may help your pet, please call and schedule an extended appointment today. Dr. Carley would be happy to fully discuss any combination of treatment options with you during this appointment. Some of the more common questions are listed below. I would like to consider veterinary acupuncture for my pet. Where should I start? You should start by scheduling an extended consult with Dr. Carley. This appointment lasts for a full hour and includes gathering a very thorough and specific history about your pet and its health conditions. This time may also be used to answer any questions you have about acupuncture treatment for your pet. How long do normal acupuncture appointments take? After the initial consult, which typically takes an hour, a normal acupuncture appointment takes about 30 minutes total. Will my pet need sedation to have acupuncture treatment? Most (99% of) animals do not require any sort of sedation for treatment. They generally respond very well and have no issues with needle placement or treatment. This will vary greatly depending on your pet and the pet’s condition. Usually, at least 3 treatments are needed before results are seen, but this can vary. Plan to bring your animal in for treatment once a week for several weeks before reassessing your pet’s condition. 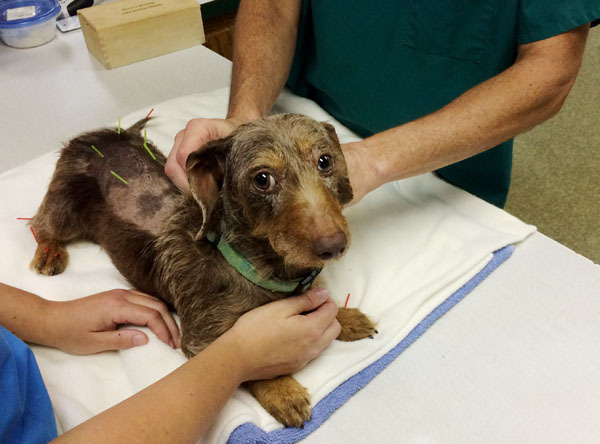 Is (small animal) veterinary acupuncture only for dogs? No, not just dogs. Cats can also benefit from acupuncture treatment. Exotics would be seen on a case-by-case basis. 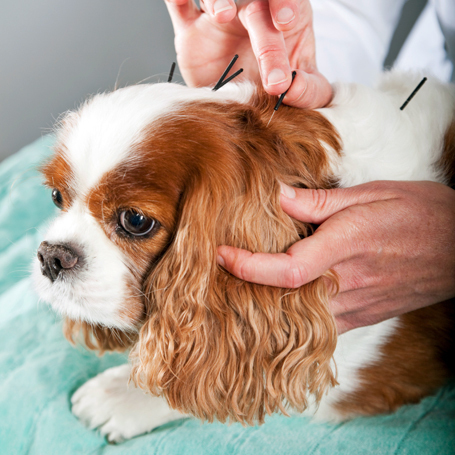 What conditions can be treated with veterinary acupuncture? There are some conditions that require Western medicine to treat, either with surgery or medications. Acupuncture may be used in conjunction with other treatments, but we will never deny a pet needed medications for a given condition. A great number of common conditions can utilize acupuncture as an alternative or addition to other treatments. One of the most common conditions that we treat with a combination of acupuncture and Western medicine is intervertebral disc disease (IVDD). This is a common disease in dachshunds that involves compression of the discs between the spinal vertebrae. It may cause paresis or paralysis and is often very painful for the dog. Surgery for this disease can be very costly, and a dog that has this disease is at an increased risk for future herniations. Acupuncture can do wonders in helping manage the pain and discomfort associated with this disease. The list is very broad. If you are in doubt, give us a call at (918) 493-3332 and we would be happy to discuss options for your pet.